“Go Big” seems to be the latest trend when it comes to television sets. This is being witnessed in an era where TVs have become Smart and they offer more than just watching your favorite shows or keeping up with the latest news. Today’s TVs serve as an access point to the internet and allow you to browse, support video streaming, and also come with Wi-Fi capabilities, Bluetooth and much more. While finding a 75-inch TV is easy, confirming that it will give you the best service is the harder part. Yes, it may be of the right size but the clarity and brightness may be off. Or it the sound quality may not be good and you have to strain to hear what is being said or it is affected by frequencies. As you will find out from this review, we have identified the best 75-inch TVs in the current market. The Sony XBR75X900F is not only popular but also among the affordable units on the market. It is based on 4K Ultra HD technology for the best picture quality and produces good audible sound. The slim television is 66 inches wide has a height of about 37 inches and a depth of 2 7/8 inches. The slim design takes minimal space hen mounted on a wall or placed in a stand. The nice looking TVs will complete different decors and can be operated for a long period without any overheating problems or noise. It works with Alexa devices and is compatible with withHDR10, HLG, and Dolby Vision. Watching TV via the UN75MU9000 4K TV from Samsung Electronics is enjoyable. You get very clear images and the sound is also amazing. The 75-inch accessory can be placed in the home, club, bar, conference room, office, and other places. It is among the smartest TVs on the scene and is also competitively priced. The Motion Rate 240 eliminates blurs, flicker, and the LED backlight minimizes shadows. Other than just watching shows and movies, this TV can also browse the internet, use apps, and stream videos. The TCL 75C807 4K Ultra HD LED TV has a dimension of 65.9(W) x 39.8(H) x 2.6(D) inches and was launched in 2017. The unit has enjoyed positive reception since launch and continues to draw a large following. It has a good 120Hz refresh rate for preventing flicker and blur and Edge LED backlight for reducing shadows and producing an excellent picture. The 4k Ultra HD resolution together with the dynamic contrast generates exceptional pictures and the powerful speaker delivers good audio. The TV is compatible with Roku, Chromecast, Pandora and other streaming services and doesn’t get too hot even after continues use. This smart LED TV is what you need to have a better TV watching experience. The 75-inch unit is perfect for the home, restaurant, club, bar, office, conference room and other places. It has a decent dimension of 66(w) x 37 ¾ (h) x 2 7/8 (d) inches without a stand and is easy to install and operate.This is improved by the highly responsive remote which has long-lasting batteries. The television set has High Dynamic Range (HDR) and good resolution for the perfect clear pictures. It also has good Led backlight for minimal shadows and doesn’t flicker thanks to the good Native refresh rate. The LG Electronics 75UJ6470 4K Ultra HD SmartTV is one of the smartest TVs and should make watching TV entertaining. It features advanced LED technology that delivers flicker-free and blurs free images. The vibrant images are made possible by the 4K Ultra HD resolution and the High Dynamic Range (HDR). The potent integrated speakers produce great audio whereas the Full-array LED backlighting to produce good brightness. It has a 60 Hz Native refresh rate and offers easy access to the internet. Connecting the TV to other devices is simplified by the HDMI ports (4), USB ports (2), and Composite, Ethernet, and Optical ports. The Samsung Electronics UN75MU6300 TV was released in 2017 and is one of the most popular. The slim design improves portability and also saves space. The TV is compatible with Vesa wall mount and fitting it takes a short time. It has high resolution for clear images and simple design for easy operation. The 120 Motion Rate prevents flicker and blurs and is built from tough materials to protect the internal components and extend its usefulness. It has several ports (HDMI, USB, and Composite) to link it with other devices such as DVD players, home theater, and sound box and game consoles. Resolution: This normally depicts the clarity of a unit and the higher the value the better the TV. 720p was standard a few years back but was overtaken by 1020p which is even better. However, 4K is the latest innovation and will produce very clear sharp images. Refresh Rate: This tells how quickly the images transition on the screen. The faster the rate the fewer blurs and flickers. 60 Hz Native Refresh rate was the standard but 120 Hz is becoming quite popular. You will also see 240Hz is some high-end TVs. NB: You shouldn’t confuse Native refresh with an effective refresh. Connectivity: As I said earlier, today’s TVs can support many functionalities. You can browse the internet, stream videos, use Wifi and Bluetooth, and also connect several devices at the same time (soundbar, DVD player, home theater and more). 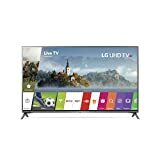 A TV with more connection points (HDMI, USB, RCA, and A/V) is much better than one with 2 or 3 points. Smart Features: You should consider a unit with many smart features since it allows you to take advantage of internet TV, video streaming services, run apps and more. The above television sets are compatible with the likes of Roku, Chromecast, Pandora, Netflix, and Hulu among others. Price: 75-Inch TVs can cost a lot and the last thing on your mind is regretting why you burst the account for a TV. You can find a top of the range TV that is within your budget. All you need is first knowing the amount of money you want to spend and then comparing different types. An even better approach is using reviews as your guide. Other things you should focus on include the space at home, design, brightness, color contrast, brand, and individual taste. Finding the perfect 75-inch TV doesn’t have to be like looking for “a needle in the haystack.” You don’t have to be very knowledgeable or experienced in this field. Also, you shouldn’t blindly buy a unit just because the seller claims it’s the best. What you need is the right information and guidance. In the above reviews, we have shown you the best 75-inch television sets in the market. We picked the ones that have exceptional clarity and brightness, the sound and picture quality is excellent, and come with Smart features for the best viewing. Simply click on any of the items and be a proud owner of the right 75-inch TV.